I have been trying hard to get more beets into my diet. They are so good for you. I tried blending them up in my vitamix, but couldn’t get them down. It was not very good. Maybe they are one of those things you have to get used to? Coconut was like that for me. I used to hate it, but now I can’t get enough! I stumbled across this recipe on Pinterest. It’s from Gluten-Free Goddess and it was amazing! Check out her blog if you get a chance. Lots of yummy recipes and many are vegan. I have made roasted beets in the past and I thought they were delicious. So I decided to give this a go. I am so glad I did! I did change a few things in the recipe, but I mostly kept it as is. I am not a fan of oranges in salad, so I omitted those. Place the beets on a lined baking sheet and drizzle with the 2 T coconut or avocado oil. Roast in the oven for about 45 minutes. While the beets are roasting, you can cook the quinoa according to the package instructions. I actually cooked the quinoa the day before. If you buy your quinoa in bulk, cook it 2 parts water per 1 part quinoa. Once the beets are done roasting, let them cool. 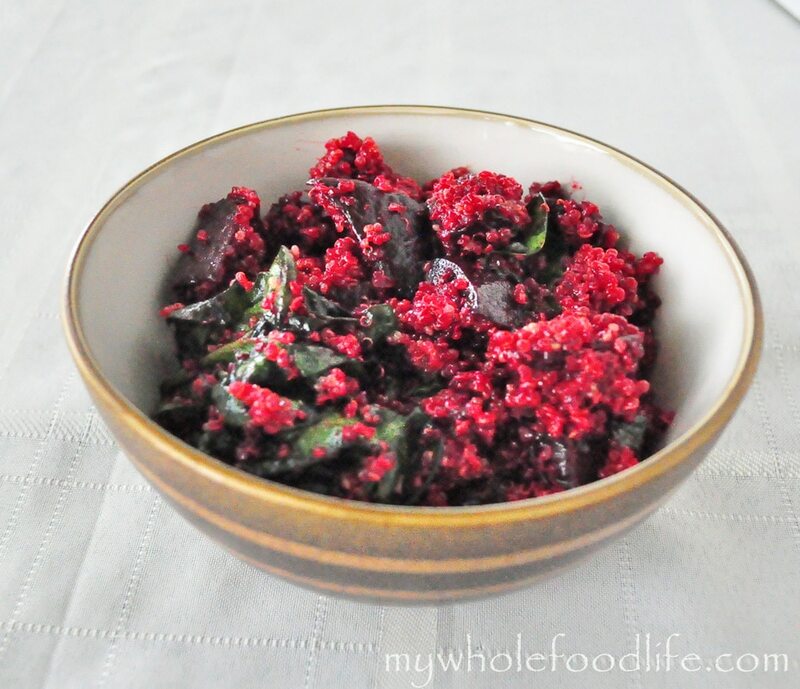 Once cooled, combine the beets and quinoa in a large bowl. In a small bowl, combine: olive oil, orange juice, soy sauce, balsamic vinegar, garlic and honey. Pour over the beets and quinoa. Now salt to taste and that’s it. We got about 4 servings. Enjoy! I know they are so healthy! I just got a juicer and plan on juicing them with carrots and an apple. You may have mentioned it, but what juicer did you go with and do you like it so far? Sorry but you read wrong no where does it say avocado oil... avocado or coconut oil.. unlike you I like beets eat them In this delicious recipe. Or braise covered with red wine vinegar, olive oil, kosher salt, pepper, garlic smashed ,fresh thyme, oregano, and fill with water. Cover pop in oven 400 degrees 1 hr 30 mins peel and slice, use liquid as dressing. Try it learned it from hells kitchen winner. When I made her recipe, I changed up a few things and the oil was one of them. I loved this dish and love roasted beets as well. This sounds like an interesting combo! Awesome recipe! I made this today & loved it! It wasn't a big hit with the kids, but I'll eat their share:). I love your blog!!!! I have a few more recipes that I'm excited to try! Glad you liked it! My kids will not touch beets either. How long do you think this will last in the refrigerator?